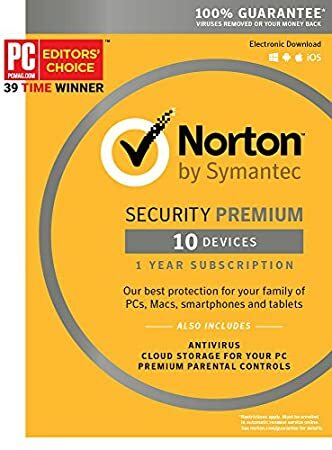 Your #1 Source for Software and Software Downloads!Norton Security Premium - 10 Device [Key Card] - Your #1 Source for Software and Software Downloads! Norton Security Premium protects your whole family of up to 10 devices-and the people who use them. Safeguard account numbers and photos on your PCs and Macs, contacts on your smartphones and private data on your tablets from criminals trying to gain access to them. It's all backed by our unique 100% guarantee. Plus, help protect your children from unsafe content and guard against oversharing. Norton Security Premium secures up to 10 PCs, Macs, iOS & Android devices, and includes parental controls to help your kids explore their online world safely, with 25GB of secure cloud PC storage. This product is 2018 ready!